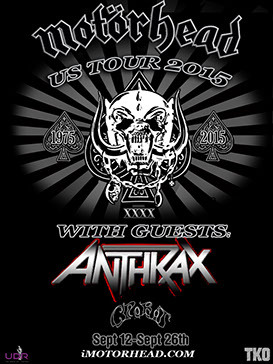 ORLANDO, Fla. – Motörhead, Anthrax and Crobot will rock the foundations of the House of Blues, on Sept. 25. The three bands will be going on tour starting on Sept. 12 at The Fillmore Detroit in Detroit and concluding on Sept. 26 at Pompano Beach Amphitheatre in Pompano Beach, Fla.
Ian “Lemmy” Kilmister is the bassist and vocalist, Phil Campbell is the guitarist and Mikkey Dee is the drummer of Motörhead. They will be promoting their 22nd album, “Bad Magic”, and celebrating 40 years. Their 13 track album includes: “Victory Or Die”, “Thunder & Lightning”, “Fire Storm Hotel”, “Shout Out All of Your Lights”, “The Devil”, “Electricity”, “Evil Eye”, “Teach Them How To Bleed”, “Till The End” and many more. To visit Motörhead’s official website, please click here. To like them on facebook, please click here. To add them to your circle on Google+, please click here. To follow them on Instagram, please click here. To follow them on Twitter, please click here. To subscribe to their channel on Youtube, please click here. Joey Belladonna is the lead vocalist, Jonathan Donais is the lead guitarist, Charlie Benante is the drummer/percussionist, Frank Bello is the bassist and Scott Ian is the rhythm guitarist of Anthrax. At times, Benante plays the lead guitar. Ian and Bello both assist with backup vocals. Their discography include: “Fistful Of Metal”, “I’m The Man EP” and “Among The Living”. They are in the process of recording a new album. Visit Anthrax’s official website, by click here. To follow like them on Facebook, please click here. To follow them on Instagram, please click here. To follow them on Twitter, please click here. To subscribe to their channel on YouTube, please click here. Brandon Yeagley is the lead vocalist and plays the harmonica, Chris Bishop is the guitarist and provides backup vocals, Jake Figueroa is the bassist and Paul Figueroa is the drummer of Crobot. They will be promoting their album, “Something Supernatural”. It features 12 tacks including: “Legend of the Spaceborne Killer”, “Nowhere To Hide”, “The Necromancer”, “La Mano de Lucifer”, “Skull of Geronimo”, “Cloud Spiller”, “Fly on the Wall” and more. Crobot’s official website can be accessed by clicking here. To like them on Facebook, please click here. To follow them on Twitter, please click here. To listen and stream their music on SoundCloud, please click here. To subscribe to their channel on YouTube, please click here. Sept. 15 - The Dome at Toyota Presents Oakdale Theatre, Wallingford, Conn.
Sept. 16 - Nikon at Jones Beach Theater, Wantagh, N.Y.
Sept. 22 - Tower Theatre, Upper Darby, Pa.
Sept. 23 - The Fillmore Charlotte, N.C.
Sept. 25 - House Of Blues Orlando, Orlando, Fla.
Sept. 26 - Pompano Beach Amphitheatre, Pompano Beach, Fla.
Sept. 28 - Motörhead’s Motorboat Cruise, Miami, Fla.
Sept. 13 - Madison Theater, Covington, Ky.
Sept. 20 - Food Truck and Rock Carnival at Oak Ridge Park, Clark, N.J.
Sept. 28 - Motörhead Motorboat Cruise, Miami, Fla.
Oct. 04 - OCEAN COWBOYS, North Charleston, S.C.
﻿Sareth Ney is the entertainment journalist for A Quarter and Dream Pictures. He holds a Bachelor of Science degree in Mass Communications and Center for New Media from Colorado State University-Pueblo. He is the former apprentice to master of horror, Clive Barker. He is known as the journalist/superhero, Wu-Man Chu, after meeting members of Wu-Tang Clan. He is an award-winning short filmmaker; his goal is to write 150 articles in select time zones, inducts artists into his hall of fame, founder and co-host of No Cover Podcast and is the festival director at Sareth-Fest Music, Comedy and Short Film Festival.